The Getty recently developed an interactive that allows you to explore symbols, details, and background information about two objects on view in a current exhibition at the Getty Villa, The Aztec Pantheon and the Art of Empire, on view through July 5. 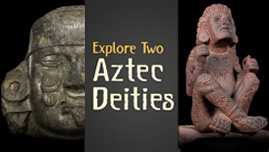 Explore two Aztec deities in this interactive. Can you think of ways to use this interactive to connect to your classroom curricula? Share your ideas by commenting on this post.